It’s no secret that Chattanooga is full of adventures. Whether you prefer hiking, biking, rock climbing, or even an exciting evening out on the town, you’ll find a million ways to entertain yourself in the Scenic City. With a range of excellent lodging options from yurts to luxury boutique hotels, your adventure doesn’t have to end when the day is done. Here are just a few of the most interesting places to rest your head in Chattanooga. Originally opened in 1909 as the Stone Fort Inn, The Dwell Hotel has seen a rich history from its street corner near the city center. The entire hotel creatively marries comfort with a clean retro style, and each of the 16 colorful rooms is unique. During your stay, make sure to enjoy a cocktail under the twinkling lights of Matilda Midnight. Tucked deep into a bend of the Tennessee River Gorge, Pot Point Cabin was constructed in 1935 from logs and planks that were salvaged from a nearby boat wreck. Today, this renovated riverside cabin is owned by the Tennessee River Gorge Trust, a local nonprofit that preserves thousands of acres in the gorge. The cabin’s open, light-filled interior feels rustic yet fresh and can accommodate up to 10 people. 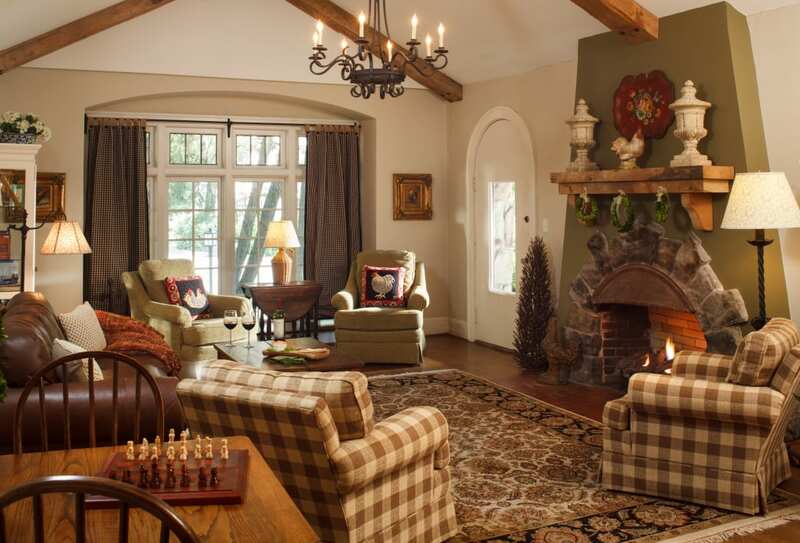 Located about a hundred yards from Rock City on Lookout Mountain, the Chanticleer Inn looks and feels like it was plucked right out of a fairy tale. With stone archways, ivy-covered walls and a meandering property made up of several small buildings, you’ll forget that Chattanooga is only a few minutes away. 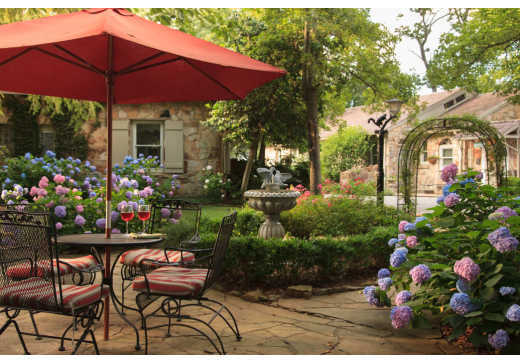 Guests will find spacious, comfortable rooms, many relaxing outdoor spaces, and a bocce court for long lazy evenings. This quirky accommodation offers the affordability and community of a traditional hostel while omitting the grunge and shabbiness that hostels typically bring to mind. The Crash Pad is modern and eco-friendly, offering both single bunks and private rooms. It’s especially popular among climbers and outdoorsy people, and the friendly staff is always happy to point you in the direction of adventure. Plus, it’s within easy reach of some of the city’s best bars and restaurants like he Flying Squirrel, Main Street Meats, and many more. This secluded cottage on Lookout Mountain is a real escape from everyday life while remaining close enough to the city for easy access. As far as charming mountain bungalows go, it doesn’t get any more picture perfect than The Blue Cottage. The cheery interior is complemented by a lovely back patio and garden, providing the ideal setting for an utterly blissful stay. Modernity meets stateliness at The Edwin Hotel, which stands equidistant from the Tennessee Aquarium, the Walnut Street Bridge, and many of the city’s other popular areas for visitors. With a rooftop pool, lavish rooms, and a wealth of bright art, there’s a surprise around every corner inside The Edwin. Make sure to enjoy a meal at Whitebird and a cocktail (or two) at Whiskey Thief rooftop bar during your stay. As one of Georgia’s largest and most scenically stunning state parks, Cloudland Canyon is about 45 minutes from downtown Chattanooga, and it is a favorite local spot for hiking and trail running. For a really special experience, rent one of its 10 surprisingly luxurious yurts for a night or two. Each one is heated, has two porches, and sleeps up to six people, but the best part is how close you’ll be to Cloudland’s towering waterfalls and breathtaking overlooks. Nestled into the riverbank in downtown Chattanooga, the Bluff View Art District might be one of the most romantic places in town. The idyllic little neighborhood features restaurants, art galleries, and proximity to the Hunter Museum, the Riverwalk, and several other beloved area attractions. The inn itself is comprised of three historic buildings tucked cozily into the art district, offering guests all the amenities of downtown with the quiet charms of an out-of-the-way inn. The phrase “luxury treehouse” might strike you as an oxymoron, but that’s exactly what Treetop Hideaways are. 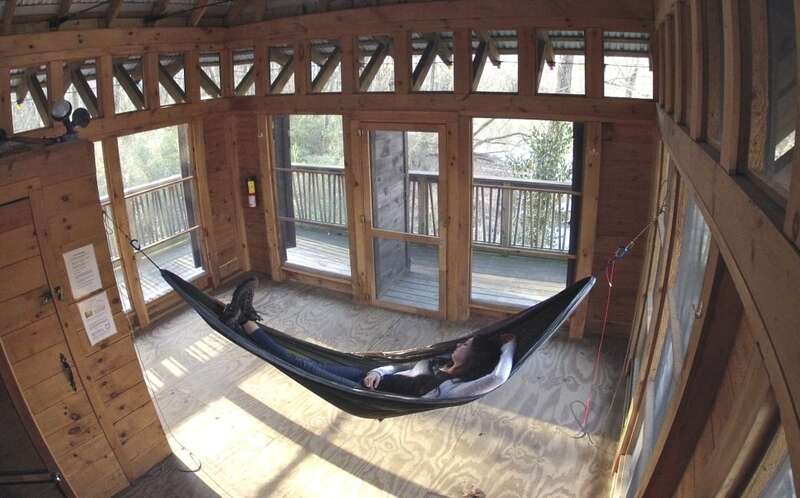 These two Chattanooga-area rentals are the treehouses of your imagination and combine the efficiency of a tiny home with the amenities of a fine hotel. Each is made largely from reclaimed materials and features fascinating peculiarities like a glassed-in tree, a whiskey barrel shower, and floor-to-ceiling windows. We’re pretty sure you won’t want to leave. If you’ve come to Chattanooga to experience glamour and nightlife, The Moxy is undoubtedly the place for you. With one of the area’s best cocktail bars, indoor and outdoor hangout areas and easy access to the vibrant Southside neighborhood, you won’t find a dull moment at The Moxy. 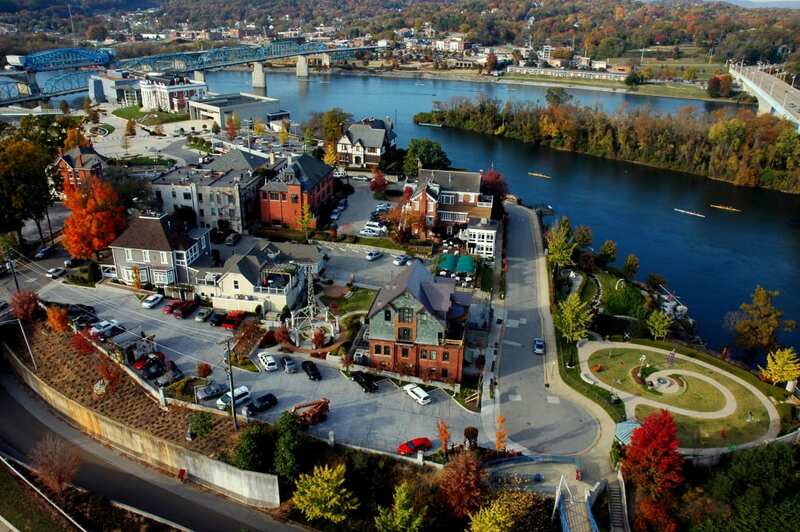 These riverfront condos are about as “Chattanooga” as it gets. Located in the beautiful river gorge, getting to downtown is just as easy as getting out on the water. Guests at River Canyon Vacation Rentals can enjoy large community pavilions, views of Signal and Elder Mountains, and free kayak and SUP access. You’ll find one of Chattanooga’s most primitive cabin experiences at Paddler’s Perch in Reflection Riding Arboretum and Nature Center. While it’s designed to be an overnight stop for Lookout Creek boaters, the Perch is also popular for kids’ sleepovers and friendly get-togethers. With its treehouse-esque atmosphere and location along the Nature Center’s boardwalk, Paddler’s Perch creates the illusion of being worlds away from the nearby city. This three-story estate in the Fort Wood Historic District was built in 1889 by Edmond G. Watkins, who later served as the mayor of Chattanooga. The stately inn has 11 elegant rooms and suites, each named for an important natural landmark near the city. Guests of the Mayor’s Mansion are treated to a complimentary three-course breakfast and will be delighted at the proximity to downtown. This unique A-frame cottage is hidden among five acres of pristine woodland on Lookout Mountain. While this spot truly is secluded, it’s only a few minutes drive from the mountain’s main attractions and all the fun of Chattanooga. However, with its beautiful forest setting and inviting hot tub, you might find that you don’t want to venture from Windsong Chalet at all. Known as one of the most luxurious hotels in Chattanooga, The Read House underwent a $25 million renovation in 2018, and the building that’s on the National Register of Historic Places (it was built in 1872) is now something special. The decor has a 1920s feel, complete with a billiards room and speakeasy off the lobby. You also can’t beat the location, which is in the heart of downtown and within walking distance of the city’s most popular attractions. Another downtown stunner, The Westin Chattanooga is filled with modern comfort. You’ll find floor-to-ceiling windows, high-end bedding, and many rooms that offer spectacular views of Lookout Mountain or the city skyline. Relax at the poolside cabanas or take advantage of everything to do within walking distance, including the Tennessee Aquarium, the Chattanooga Convention Center, and Tivoli Theater.